Don't let the cost of downtime keep you from meeting your service and revenue expectations. Keep your critical systems running without expensive service calls. Use low-cost remote power control to automatically reboot failed devices and get up and running in the most cost effective way possible. All iBoots (AC) are supplied with power and outlet cords for North America. It can automatically sense trouble using advanced AutoPing features and reboot to get you up and running fast. Web Browser Power Control Clean Web page design for immediate status and power control. Auto detects mobile browsers. No special software required. Automatic System Restoral AutoPing and Heartbeat detect network or equipment outage and takes immediate action to restore your network or device. Real time scheduling to have a fresh reboot each morning or minimize power waste at night. Cloud Control Manage all your iBoots from a single sign-on. Control power worldwide from any web browser, anytime anywhere. Graceful Shutdown Attempts to do a Graceful Shutdown or Restart on Windows platforms prior to hard power switch. Add one or two iBoot-EXP expansion units with independent control, and AutoPing. When not used for expansion units, the inputs and outputs can be used for general purpose I/O or as manual power control. Out-of-band management with simple serial commands for status, control and setup. UL Listed We take your safety seriously. Be confident to pass fire marshal inspections. Dual Password Protected Separate user and administrator passwords. Deploy iBoots throughout your organization. IP Addressed, 10/100 Base-T Use on any Ethernet IP network. Public or private. Supports DHCP and alternate ports for Web Access. Direct TCP and Software Control Control iBoot-G2 directly from your software application for the highest degree of power control integration. Simple protocol is freely available. Use iBoot-G2 control program to call power control from any network management system. Auto ranging power input. Deploy iBoot-G2 anywhere in the world. 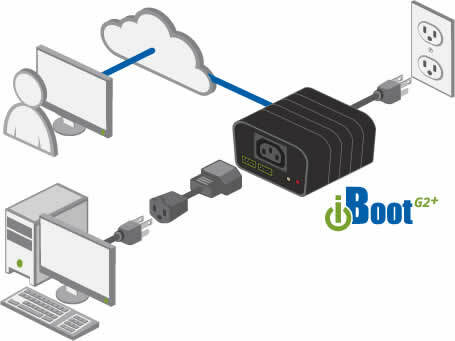 iBoot-G2 uses IEC320 Connectors and includes line and extension cords for North America. 12 Amp Switching Current for most Servers, Routers, Kiosks, etc. 10 Amps at 220 VAC.